1.Take pink foam and cut out a heart shape from it. Now cut out a smaller heart from the middle. You have to no worries about the shapes as it will be covered up. 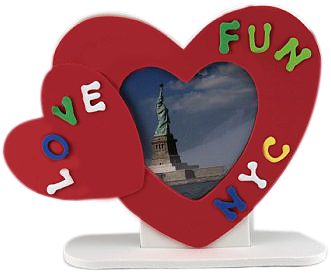 2.Glue the foam hearts to the heart frame, then overlapping them and covering all to the frame. Leave it for dry. 3.When the glue is dry use double sides sticky tape to stick your photo to the back of the frame. 4.Cut a piece of card the same size as the frame and stick it on to the back with double sided tape. 5.At last glue a magnet on to the middle of the card.